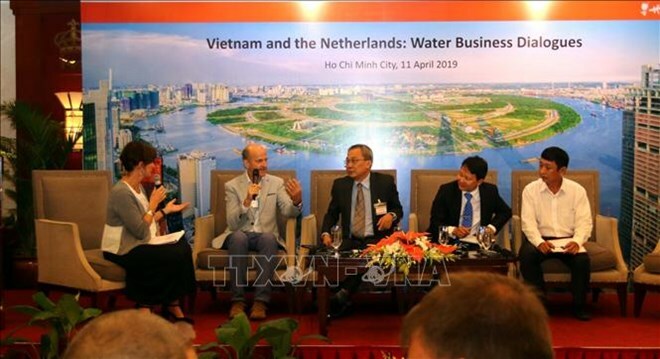 The event brought together more than 100 Vietnamese and Dutch scientists, experts and businesspeople in the field of water and environment, along with leaders of departments and universities in Ho Chi Minh City, and 13 cities and provinces in the Mekong Delta. Dutch Minister of Infrastructure and Water Management Cora Van Nieuwenhuizen spoke highly of Vietnam’s great attention to issues regarding water management and climate change. More attention should be paid to saltwater intrusion prevention and water resource management in serve of agricultural production, and clean water supply in the Mekong Delta, thus contributing to spurring the regional development, she suggested. Nieuwenhuizen expressed her hope that cooperation projects between Vietnam and the Netherlands in water resource management and environmental protection in the Mekong Delta in the time ahead will help open up many economic development opportunities, and improve operational capacity of local river ports and water transport, and ensure clean water supply for local people. The Netherlands stands ready to support and share knowledge and experience in this field with Vietnam, especially coastal localities in the Mekong Delta in climate change adaptation, she said. Sharing Nieuwenhuizen’s views, Deputy Director of Can Tho city’s Department of Agriculture and Rural Development Pham Truong Yen said the lack of water management has resulted in saltwater intrusion, flooding and water shortage in the dry season. The Blue Dragon project, with the support of Dutch experts, has partially helped ease environmental pollution after dams were built to prevent saltwater intrusion in the Mekong Delta, he said. Can Tho has built water management systems in O Mon district and Xang Xa No cannel, he added. Menno Snel, Dutch State Secretary for Finance, underlined the importance of the water sector to national construction and development. Therefore, it is necessary to invest in mid- and long-term projects on water management in order to serve sustainable development, he said, noting that these big projects require attention and investment from both Vietnamese and Dutch Governments in order to push ahead with efficient water management in the Mekong Delta. Over the past five years, more than 300 Dutch experts and researchers have organised over 200 workshops on water management, environmental protection and climate change adaptation in the Mekong Delta. Many Dutch organisations and experts have also shared experience in risk management and mitigation, and flood combat with Can Tho city, and Soc Trang and Kien Giang provinces.